Business Time is a new application from Global Media Empire which lets you track work hours along with location. It is a useful application for anyone who are paid on hourly basis and tracking work performance. 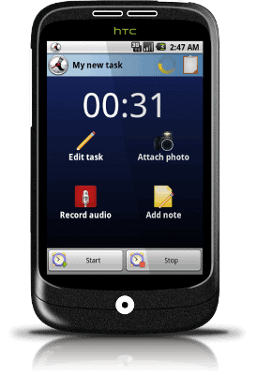 The application allows to add pictures and voice memos to track your work performance. It is also able to email completed time sheets as documents (CSV format), each task can be stored, backed up and restored to SD card which helps in transferring the data between phones easily. The application can be used in the background without disrupting your mobile experience. There is a free version of this application available in the Android Market. The free version is limited to five projects , 50 tasks and timers to 100. The paid version is available for $9.99 has no limitations. For more details, check their website.